Jadeite: Mineral information, data and localities. 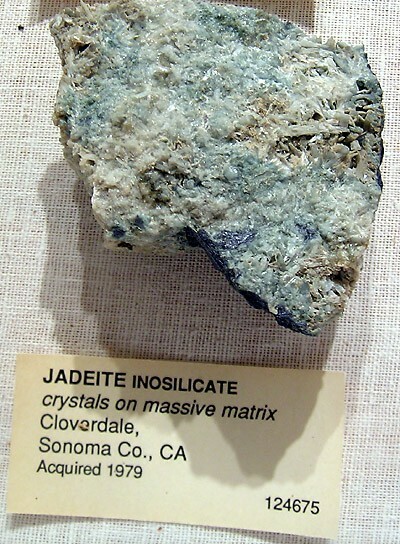 Named after jade, which is frequently composed of jadeite. Rarely found as euhedral crystals, most commonly as the monomineralic metamorphic rock jadeitite which is often used as an ornamental gem and carving material as which it is known as jadeite jade. Visit gemdat.org for gemological information about Jadeite. Chloromelanite A dark green to black variety of jadeite. Chromian Jadeite A Cr-bearing variety of jade. Itoigawaite 3 photos of Jadeite associated with Itoigawaite on mindat.org. Rengeite 3 photos of Jadeite associated with Rengeite on mindat.org. Kosmochlor 2 photos of Jadeite associated with Kosmochlor on mindat.org. Stronalsite 2 photos of Jadeite associated with Stronalsite on mindat.org. Albite 2 photos of Jadeite associated with Albite on mindat.org. Glaucophane 1 photo of Jadeite associated with Glaucophane on mindat.org. Nybøite 1 photo of Jadeite associated with Nybøite on mindat.org. Yoder, H.S. (1950) The jadeite problem. American Journal of Science: 248: 225-248. Wolfe, C.W. (1955) Crystallography of jadeite crystals from near Cloverdale, California. American Mineralogist: 40: 248-260. Prewitt, C.T. and Burnham, C.W. (1964) Crystal structure of jadeite, NaAlSi2O6 (abstract): Geological Society of America Program, Miami, Florida, meeting: 156, November 1964. Prewitt, C.T. and Burnham, C.W. (1966) The crystal structure of jadeite, NaAlSi2O6. American Mineralogist: 51: 956-975. Bradt, R.C., Newnham, R.E., and Biggers, J.V. (1973) The toughness of jade. American Mineralogist: 58: 727-732. Cameron, M., Shigeho, S., Prewitt, C.T., and Papike, J.J. (1973) High-temperature crystal chemistry of acmite, diopside, hedenbergite, jadeite, spodumene and ureyite. American Mineralogist: 58: 594-618. Rossi, G., Smith, D.C., Ungaretti, L., and Domeneghetti, M.C. (1983) Crystal-chemistry and cation ordering in the system diopside-jadeite: a detailed study by crystal structure refinement. Contributions to Mineralogy and Petrology: 83: 247-258. Morimoto, N. (1989) Nomenclature of pyroxenes. The Canadian Mineralogist: 27: 143-156. Nestola, F., Ballaran, T.B., Liebske, C., Bruno, M., and Tribaudino, M. (2006) High-pressure behaviour along the jadeite NaAlSi2O6–aegirine NaFeSi2O6 solid solution up to 10 GPa. Physics and Chemistry of Minerals: 33: 417-425. Nestola, F., Tribaudino, M., Boffa Ballaran, T., Liebske, C., and Bruno, M. (2007) The crystal structure of pyroxenes along the jadeite-hedenbergite and jadeite-aegirine joins. American Mineralogist: 92: 1492-1501. McCarthy, A.C., Downs, R.T., and Thompson, R.M. (2008) Compressibility trends of the clinopyroxenes, and in-situ high-pressure single-crystal X-ray diffraction study of jadeite. American Mineralogist: 93: 198-209. Nestola, F., Ballaran, T.B., Liebske, C., Thompson, R., and Downs, R.T. (2008) The effect of the hedenbergitic substitution on the compressibility of jadeite. American Mineralogist: 93: 1005-1013. Knight, K.S. and Price, G.D. (2008) Powder neutron-diffraction studies of clinopyroxenes. I. The crystal structure and thermoelastic properties of jadeite between 1.5 and 270 K. The Canadian Mineralogist: 46: 1593-1622. Franz, L., Sun, T.T., Hänni, H.A., de Capitani, C., Thanasuthipitak, T., and Atichat, W. (2014) A comparative study of jadeite, omphacite and kosmochlor jades from Myanmar, and suggestions for a practical nomenclature. Journal of Gemmology: 34(3): 210-229. Posner, E.S., Dera, P., Downs, R.T., Lazarz, J.D., and Irmen, P. (2014) High-pressure single-crystal X-ray diffraction study of jadeite and kosmochlor. Physics and Chemistry of Minerals: 41: 695-707. Washington, H.S. (1929) The American Mineralogist, 14, 369-372. Tomioka, N. & Miyahara, M. (2017) High-pressure minerals in shocked meteorites: Meteoritics & Planetary Science 52(9): 2017-2039. (Sept 2017). L. W. Curtis And J. Gittins (1979) Aluminous and Titaniferous Clinopyroxenes from Regionally Metamorphosed Agpaitic Rocks in Central Labrador. J. Petrology 20:165-186.; Curtis, L.W. & Currie, K.L. (1977) Geology and petrology of the Red Wine complex, Central Labrador. GSC Bulletin 287, 61p. + maps; Curtis, L., Gittins, J., Kocman, V., Rucklidge, J. C., Hawthorne, F. C., & Ferguson, R. B. (1975). Two crystal structure refinements of a P2/n titanian ferro-omphacite. The Canadian Mineralogist, 13(1), 62-67. Maresch, W. V., Grevel, C., Stanek, K. P., & Carpenter, M. A. (2007). Coexisting jadeite and omphacite in metabasites from the Escambray Massif, Cuba. Geochim. Cosmochim. Acta, 71, A621. ; Maresch, W. V., Grevel, C., Stanek, K. P., Schertl, H. P., & Carpenter, M. A. (2012). Multiple growth mechanisms of jadeite in Cuban metabasite. European Journal of Mineralogy, 24(2), 217-235. Hertwig A, McClelland W, Kitajima K, Schertl H, Maresch W, Valley J (2014) A comprehensive ion microprobe study on zircon from jadeitites and related rocks from the Rio San Juan Complex, Dominican Republic. 21 st meeting of the International Mineralogical Association. p 198; Krebs, M., Maresch, W. V., Schertl, H. P., Münker, C., Baumann, A., Draper, G., ... & Trapp, E. (2008). The dynamics of intra-oceanic subduction zones: a direct comparison between fossil petrological evidence (Rio San Juan Complex, Dominican Republic) and numerical simulation. Lithos, 103(1-2), 106-137. Lukas, Yann (1978) Roches et minéraux de Bretagne. Editions Ouest-France, 33 pp. Chauris, L. (2014): Minéraux de Bretagne, Les Editions du Piat, 272. Mevel, C., and J. R. Kienast (1980) Chromian jadeite, phengite, pumpellyite, and lawsonite in a high-pressure metamorphosed gabbro from the French Alps. Mineralogical Magazine : 43 (332): 979-984. Eur. J. Mineral. , 1991, 3, pp. 343-366. [var: Chloromelanite] Reinecke, T. (1982): Contributions to Mineralogy and Petrology 79, 333-336.; Reinecke, T. (1986): Crystal chemistry and reaction relations of piemontites and thulites from highly oxidized low grade metamorphic rocks at Vitali, Andros Island, Greece. Contributions to Mineralogy and Petrology 93, 56-76. [var: Chloromelanite] Eur. J. Mineral. , 1992, 4, pp. 619-634. Breecker, D.O. (2001) Mineral assemblages in high-pressure quartz-mica schists from Syros, Cyclades, Greece (Doctoral dissertation, Amherst College). ; Valaas, E.P. (2001) The petrology of mafic schists of southern Syros, Greece. 14th Keck Symposium Volume, p. 147.; Schumacher, J.C., Brady, J.B., Cheney, J.T., and Tonnsen, R.R. (2008) Glaucophane-bearing marbles on Syros, Greece. Journal of Petrology 49, 1667-1686. Gunnar Färber specimens; Altherr, R., Soder, C., Panienka, S., Peters, D., & Meyer, H. P. (2013). Pink manganian phengite in a high P/T meta-conglomerate from northern Syros (Cyclades, Greece). Contributions to Mineralogy and Petrology, 166(5), 1323-1334. Harlow, G. E. (1994). Jadeitites, albitites and related rocks from the Motagua Fault Zone, Guatemala. Journal of Metamorphic Geology, 12(1), 49-68. [var: Chloromelanite] P. Nisio and J.M. Lardeaux, Bull. Minéral. , 1987, 110, pp. 427-437.
http://www.ngu.no/FileArchive/165/2003_055.pdf Geological Survey of Norway / The Alice Wain Memorial West Norway Eclogite Field Symposium / Abstract Volume p. 37. Castelli, D., Rostagno, C., Lombardo, B. (2002): Jd-Qtz-bearing metaplagiogranite from the Monviso meta-ophiolite (Western Alps). Ofioliti, 27, 81-90; Lombardo, B., Rubatto, D., Castelli, D. (2002): Ion microprobe U-Pb dating of zircon from a Monviso metaplagiogranite: implications for the evolutions of the Piedmont-Liguria Thetys in the Western Alps. Ofioliti, 27, 109-117; Piccoli, G.C. (2002): I minerali delle Alpi Marittime e Cozie. Provincia di Cuneo. Associazione Amici del Museo "F. Eusebio" di Alba, Ed., Alba, 362 pp. ; Castelli, D., Lombardo, B. (2007): The plagiogranite - FeTi-oxide gabbro association of Verné (Monviso metamorphic ophiolite, Western Alps). Ofioliti, 32, 1-14; Piccoli, G.C., Maletto, G., Bosio, P., Lombardo, B. (2007): Minerali del Piemonte e della Valle d'Aosta. Associazione Amici del Museo "F. Eusebio" di Alba, Ed., Alba, 607 pp. 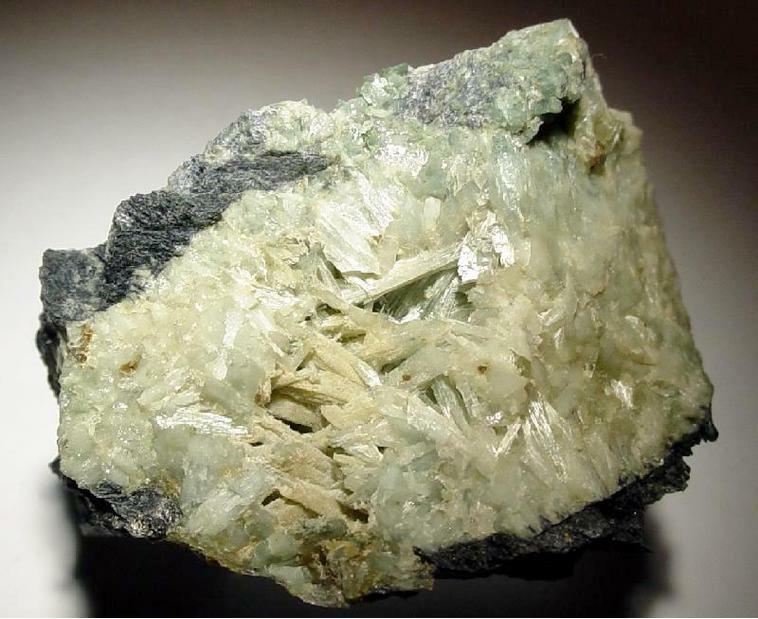 [var: Chloromelanite] Eur. J. Mineral. , 1989, 1, pp. 89-104. [var: Chloromelanite] Fornaseri, M., Bensa, G. (1939): Sulla cloromelanitite di Mocchie in Val di Susa. Periodico di Mineralogia, 10, 217-230; Barresi, A. (1996): La Val di Susa e i suoi minerali. Volume I. Gruppo Mineralogico e Paleontologico C.A.I.-U.G.E.T., Torino, 37 pp. Saito, M. & Miyazaki, K. (2006) Bulletin of the Geological Survey of Japan, 57, #5-6. Alfredo Petrov specimens, field collected 2006-2012. Miyajima et al. (2001) Mineralogical Magazine 65, 111-120; Miyajima et al. (1999) Mineralogical Magazine 63, 909-916. Mineralogical Journal Vol. 13 (1986) , No. 6 pp368-375; Shi, G., Harlow, G. E., Wang, J., Wang, J., Ng, E., Wang, X., ... & Cui, W. (2012). Mineralogy of jadeitite and related rocks from Myanmar: a review with new data. 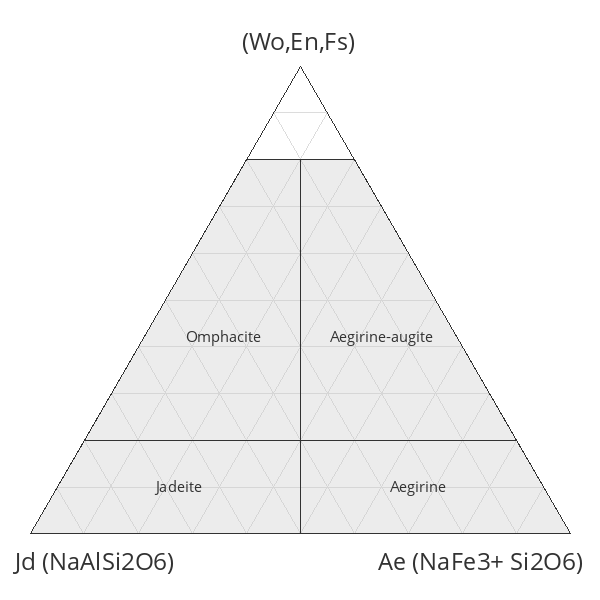 European Journal of Mineralogy, 24(2), 345-370. Ou Yang, Chiu-mei. (1985) A mineralogical study of Burmese jadeite jade. MS Thesis University of Hong Kong;Shigley, J. E., Dirlam, D. M., Laurs, B. M., Boehm, E. W., Bosshart, G., & Larson, W. F. (2000). Gem localities of the 1990s. Gems & Gemology, 36(4), 292-335.; Nyunt, T. T. (2009). Petrological and geochemical contribution to the origin of jadeitite and associated rocks of the Tawmaw Area, Kachin State, Myanmar. Gems & Gemology, winter 2001, 329. Themelis, Ted, 2008, Gems and Mines of Mogok. ; Wang, X., Shi, G. H., Qiu, D. F., Wang, J., & Cui, W. Y. (2012). Grossular-bearing jadeite omphacite rock in the Myanmar jadeite area: a kind of jadeitized rodingite?. European Journal of Mineralogy, 24(2), 237-246. Ozawa, S., Ohtani, E., Suzuki, A., Miyahara, M., Terada, K., & Kimura, M. (2007, December). Shock metamorphism of L6 chondrites Sahara 98222 and Yamato 74445: the PT conditions and the shock age. In AGU Fall Meeting Abstracts. Contr. Min. Petr. (1998) 131, (2-3), 111 - 122.; Matsukage, K., and Arai, S. (1998): Contributions to Mineralogy and Petrology 131, 111-122. Wajsprych B. 2008: Tectonic meaning of the jadeite-blueschist, ophiolite, and radiolarite exotics in flysch-mélange succession of the Western Kaczawa Complex (the Sudetes). Mineralogia - Special Papers, vol. 32, p. 164-165; Wajsprych, B., & Achramowicz, S. (2003). On the new wildflysch-to-flysch, blueschist-rich Lower Visean succession of the Western Sudetes (SW Poland). In Annales Societatis Geologorum Poloniae (Vol. 73, No. 2, pp. 123-137). Shin Ozawa, Masaaki Miyahara, Eiji Ohtani, Olga N. Koroleva, Yoshinori Ito, Konstantin D. Litasov & Nikolay P. Pokhilenko (2014): Jadeite in Chelyabinsk meteorite and the nature of an impact event on its parent body. Scientific Reports 4, Article number: 5033. Kuznetsov, Y. V., Kuznetsova, N. A., & Tsyutskiy, S. S. (1986). Features Of Jadeite Mineralization In The Pus'yerka Deposit (Polar Urals). International Geology Review, 28(9), 1096-1101. Stalder, H. A., Wagner, A., Graeser, S. and Stuker, P. (1998): "Mineralienlexikon der Schweiz", Wepf (Basel), p. 226. Çetinkaplan, M., Candan, O., Oberhänsli, R., and Bousquet, R. (2007): Lithos 104(1-4), 12-32. Okay, A.I. (1997): Mineralogical Magazine 61, 835-843. Bloxam, T.W. (1960), Jadeite rocks and glaucophane schists from Angel Island, San Francisco Bay, California: American Journal of Science: 258: 558-560; Coleman, R.G. (1965), Composition of jadeite pyroxene from the California graywackes: USGS PP 525-C: 26-27; Coleman, R.G. & J.R. Clark (1968), Pyroxenes in the blueschist facies of California: American Journal of Science: 266: 44; Pemberton, H. Earl (1983), Minerals of California; Van Nostrand Reinholt Press: 390. Murdoch, Joseph & Robert W. Webb (1966), Minerals of California, Centennial Volume (1866-1966): California Division Mines & Geology Bulletin 189: 309; Pemberton, H. Earl (1983), Minerals of California; Van Nostrand Reinholt Press: 390. Wolfe, C.W. & Daphne Riska (1951), Crystallography of jadeite from near Cloverdale, California: (abstract): Geological Society of America Bulletin: 62: 1491; Wolfe, C.W. (1955), Crystallography of jadeite crystals from near Cloverdale, California: American Mineralogist: 40(3-4) 248; Murdoch, Joseph & Robert W. Webb (1966), Minerals of California, Centennial Volume (1866-1966): California Division Mines & Geology Bulletin 189: 309; Edgar, A.D., A. Mottana, and N.D. MacRae (1969) The chemistry of cell parameters of omphacite and related pyroxenes. Mineralogical Magazine: 37: 64, 67-68. Onucki, H. and Ernst, W.G. (1969) Coexisting sodic amphiboles and sodic pyroxenes from blueschist facies metamorphic rocks. Mineralogical Association of America Special Paper 2: 245; Pemberton, H. Earl (1983), Minerals of California: 390-391. Anonymous (1950), New jade occurrence in California: California Division of Mines, Mineral Information Service: 3(11): 2; Yoder, Hatten S., Jr. & Charles W. Chesterman (1951), Jadeite of San Benito County, California. California Division of Mines, Special Report 10-C: 6; Murdoch, Joseph & Robert W. Webb (1966), Minerals of California, Centennial Volume (1866-1966): California Division Mines & Geology Bulletin 189: 66, 70. Yoder, Hatten S., Jr. & Charles W. Chesterman (1951), Jadeite of San Benito County, California. California Division of Mines, Special Report 10-C: 6; Murdoch, Joseph & Robert W. Webb (1966), Minerals of California, Centennial Volume (1866-1966): California Division Mines & Geology Bulletin 189: 309; Pemberton, H. Earl (1983), Minerals of California; Van Nostrand Reinholt Press: 390.
ⓘ Cape San Martin prospect (Jade Cove prospect) ? Bloxam, T.W. 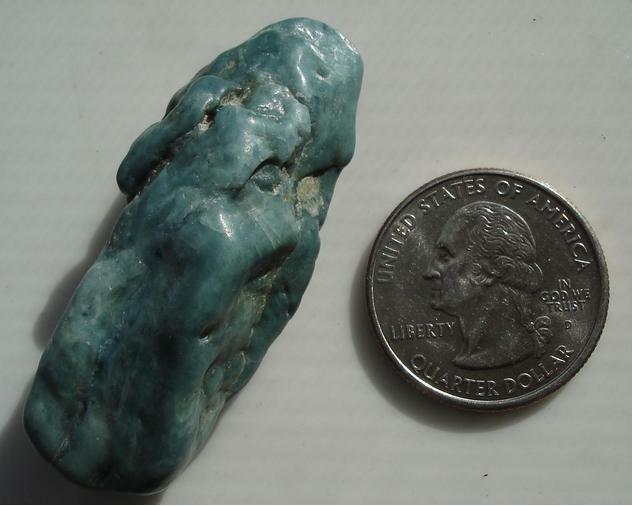 (1956), Jadeite-bearing metagraywackes in California: American Mineralogist: 41: 489; Pemberton, H. Earl (1983), Minerals of California; Van Nostrand Reinholt Press: 391. Chesterman, C.W. (1950a), Jadeite in San Benito County, California: Lapidary Journal: 4: 204-208; Coleman, R.G. (1961), Jadeite deposits of the Clear Creek area, New Idria District, San Benito County, California: Journal of Petrology: 2: 225; Pemberton, H. Earl (1983), Minerals of California; Van Nostrand Reinholt Press: 49, 410. Anonymous (1950), Jadeite from Clear Creek, San Benito Co.: California Division of Mines, Mineral Information Service: 3(4): 2; Dake, H.C. (1951), The jadeite locality; The Mineralogist: 18: 188-190; Yoder, Hatten S., Jr. & Charles W. Chesterman (1951), Jadeite of San Benito County, California. California Division of Mines, Special Report 10-C: 3; Murdoch, Joseph & Robert W. Webb (1966), Minerals of California, Centennial Volume (1866-1966): California Division Mines & Geology Bulletin 189: 239, 299, 309; T. Tsujimori et al., Paper N° 21-6, The Geological Society of America, Joint Meeting Cordilleran Section and Pacific Section, 101st Annual Meeting, 29 April-1 May 2005, San Jose, California. Yoder, Hatten S., Jr. & Charles W. Chesterman (1951), Jadeite of San Benito County, California. California Division of Mines, Special Report 10-C: 6; Murdoch, Joseph & Robert W. Webb (1966), Minerals of California, Centennial Volume (1866-1966): California Division Mines & Geology Bulletin 189: 310. Pemberton, H. Earl (1983), Minerals of California; Van Nostrand Reinholt Press: 391. Gems & Minerals (1963): July: 20-22. Yoder, Hatten S., Jr. & Charles W. Chesterman (1951), Jadeite of San Benito County, California. California Division of Mines, Special Report 10-C: 6; Murdoch, Joseph & Robert W. Webb (1966), Minerals of California, Centennial Volume (1866-1966): California Division Mines & Geology Bulletin 189: 310; Pemberton, H. Earl (1983), Minerals of California; Van Nostrand Reinholt Press: 391.